For most of the past five thousand years, the techniques of glassmaking were passed only in strict confidence from master to apprentice. When artisans did commit methods to writing, they were held close as precious possessions, often passed down within families. Inevitably though, some glass recipe compilations did become public, a few were even purposefully shared. But before the advent of printed books and some time after, a manuscript was typically propagated through the laborious and often error-prone process of writing copies out by hand. Even at the beginning of the seventeenth century, a mere four hundred years ago, glassmaking techniques and materials were passed primarily through the apprentice system. All of that changed forever, in 1612, when a Florentine priest named Antonio Neri published the first printed book devoted to the ‘art of glassmaking’. In fact, the title he chose was exactly that: L’Arte Vetraria. 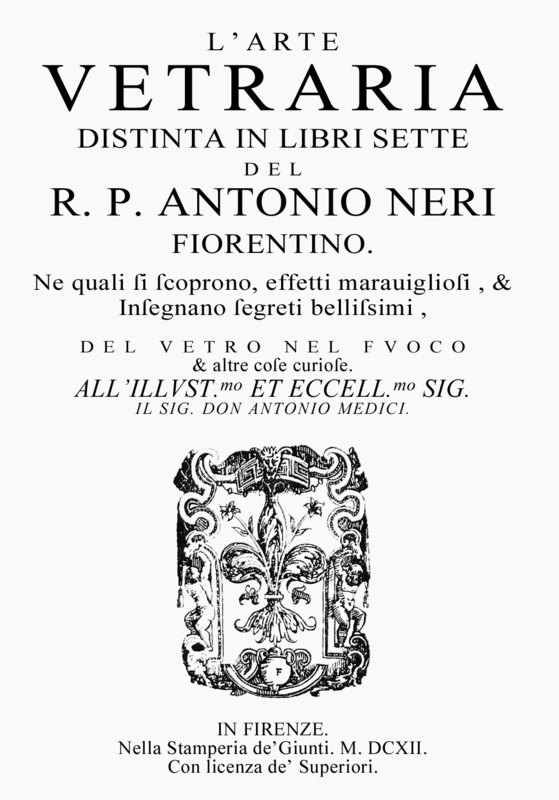 Neri’s volume was noticed almost immediately by technical types; Galileo owned a copy and supplied one to his friend Federico Cesi, founder of an early scientific society called the Lincei [lynxes]. In his introduction, Neri specifically invites anyone curious and willing to apply themselves to give glassmaking a try, saying, “Unless you purposely foul-up, it will be impossible to fail”. However, the book did not exactly catch fire with the general public. Slowly but surely, copies found their way to the hands of early scientific investigators and also to the hands of glassmakers throughout Europe. As Italian artisans migrated to northern Europe, Neri’s book came with them. In 1661, a reprint of L’Arte Vetraria was issued in the priest’s native Florence, the next year an English translation was published in London for the Royal Society and the year after that a Venetian edition appeared. Within ten years, illustrated Latin and German translations were published and French and Spanish versions were not far behind. By the year 1800 over two dozen editions circulated around Europe. It had become the de facto bible of glassmakers throughout. 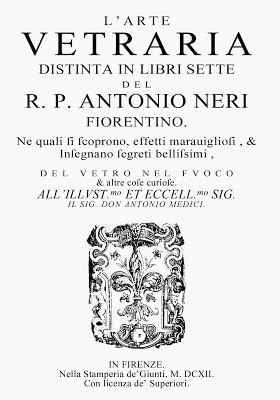 There is precious little personal information in the book about Neri, but it does make clear that he started his career at the Medici court, in the laboratory of prince Don Antonio de’ Medici. He went on to work in a glass house in Pisa – one that supplied fine glassware to the Vatican – and then spent the bulk of his career, seven years, in Antwerp. Neri’s book, L’Arte Vetraria, shined brightest in the hands of an artisan. Neri has the rare ability to translate non-verbal skills into written words. Where exact amounts could not be given, he urges the glassmaker to develop an eye for the right color and to take the final intended purpose into account. He warns against the pitfalls of roasting a chemical too much or not purifying an ingredient enough. His book became a platform upon which later glass experimenters added their own findings and it became a kind of working document. This started with the 1662 English translation by London physician Christopher Merrett. Not particularly familiar with glassmaking himself, Merrett canvassed experienced artisans in England and made extensive notes that he appended to Neri’s original. Merrett also rearranged Neri’s text in a format that he felt more appropriate. The Latin edition by Frisius, in Amsterdam, restored Neri’s original format, but also retained Merrett’s observations. In 1679, Johann Kunckel made a German translation that added his own extensive knowledge, producing what is perhaps the most authoritative edition that the book attained. In 1697, Jean Haudicquer de Blancourt translated Merrett’s English edition into French, but he gave no acknowledgment to Neri or Merrett. Blancourt plagiarized the work, putting his own name as the sole author. He greatly expanded the page count, but added little or no new material. Where Neri stipulated, for instance, that artificial gems of all colors could be made by adding previously discussed pigments to a basic lead glass formula, Blancourt turned each of these into a separate recipe. In doing this, that one particular section grew larger than the entirety of Neri’s original book. Two years later, in 1699, Daniel Brown translated Blancourt’s English-to-French rendition back into English. From there, the formulas – especially the artificial gem recipes – started to appear un-attributed in popular craft encyclopedias; the Neri provenance of these recipes was now erased, but they continued to influence artisans through the nineteenth century. On one hand, this particular lineage of the book is remarkable for the tour of languages; Italian, English, German, French, Spanish and Japanese. On the other hand, it spans a remarkable period in history, starting with alchemy and progressing through the volumes to modern science. With each new set of annotations Neri's book starts with a purely empirical set of recipes, using classical alchemy. By Kunckel’s edition, experimentation was more formalized and rigorous; the chemistry behind pigments for coloring glass became an intense subject of scrutiny. By Holbach’s edition, the physical and mechanical properties of glass were being investigated and in turn, glass played an ever-critical role in instrumentation like thermometers, barometers, microscopes, telescopes and a newly invented electrical device called a Leiden jar. Antoine Lavoisier is considered by many to be the ‘father of modern chemistry’. For all practical purposes, his isolation of oxygen as a discrete element, in 1778, rang the death knell for classical alchemy. About 1799, Lavoisier’s good friend Pierre Loysel wrote what was to be the successor to Neri’s book on glassmaking, Essai sur l’art de la verrerie [Essays on the art of Glassmaking]. While it never attained the fame or currency of Neri’s contribution, it did mark the passing of the mantle to new techniques and a better understanding of the materials. For nearly two centuries before Loysel, Neri’s book and its derivatives held the floor as the authoritative reference for glassmakers throughout Europe and beyond. 187 years is a remarkable run for any book, even more so for a volume devoted to technical advice and recipes. 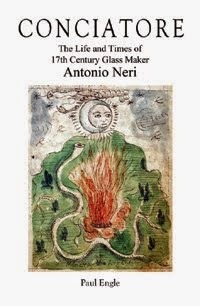 Antonio Neri would have probably preferred to be remembered for his work on alchemical transmutation and medicinal cures, but in the end it was his sensible book on glass formulation that continues to endear him to anyone interested in the art of glass. L’Arte Vetraria by Antonio Neri, Japanese Translation, Hironobu Sakata, Mayumi Ikeda eds., tr. (Yokohama: Shunpusha, 2007), a translation of Neri 1759 (Holbach). Pierre Loysel, Essai sur l’art de la verrerie (Paris, 1799/1800).